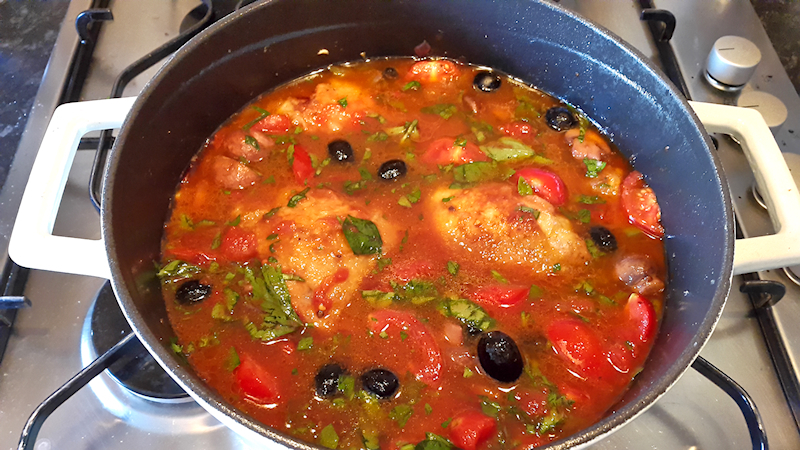 An awesome recipe for Italian Chicken Cacciatore in a wine and tomato sauce. 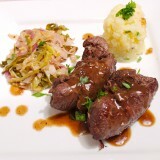 Best served with Bucatini pasta or wild rice. 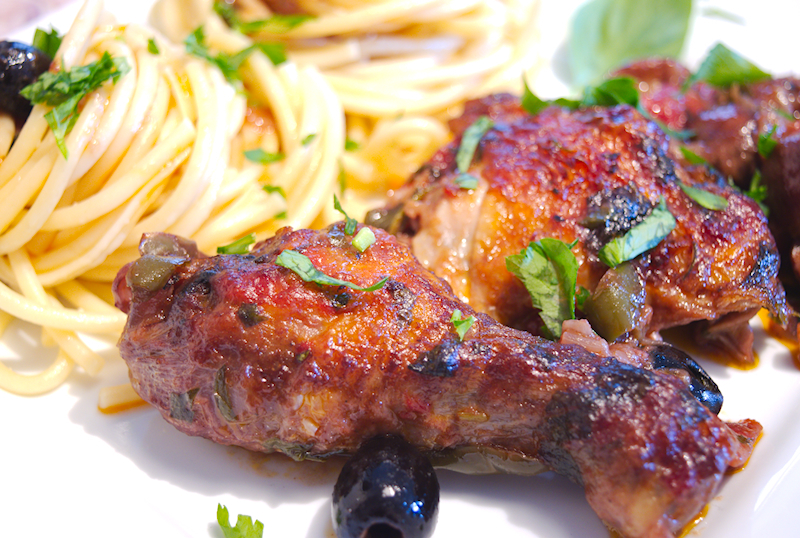 From what I understand, Chicken Cacciatore (the Italian Hunter’s chicken) doesn’t exist! At least, not as an official recipe. 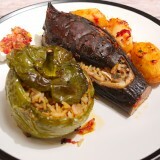 That makes sense as the purpose of the dish was for the hunters to cook something fast with the catch of the day. So, I am not even sure if chicken is actually involved. Apparently, the hunters used what they had in the fridge to make a hearty meal. What would you find in an Italian house? Tomatoes, wine, basil, olives. Use all of that, add your meat, put it in the oven and you are done! 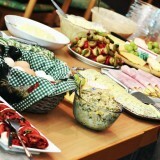 Here we are talking about feeding some serious eaters that can appreciate good food. 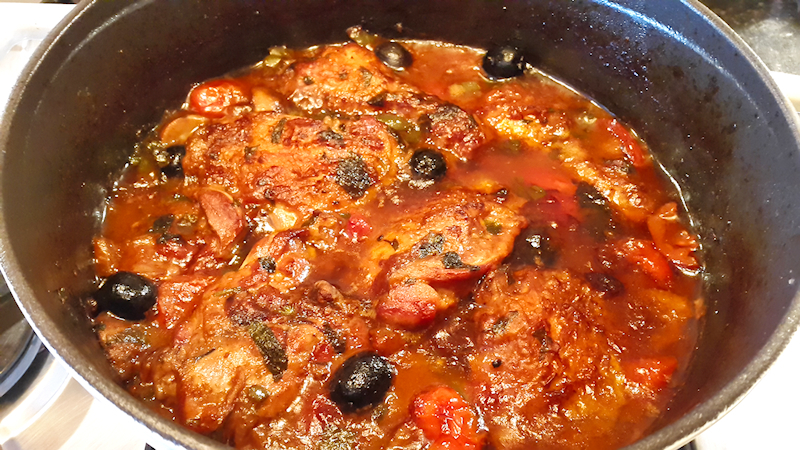 Chicken Cacciatore is a stew (or casserole) dish that needs to be enjoyed by talking the time to appreciate every little bite. All the flavors from each ingredient are combined perfectly to take you to heaven. But, do you have to use mushrooms? Would the Italians use mushrooms in such a dish? 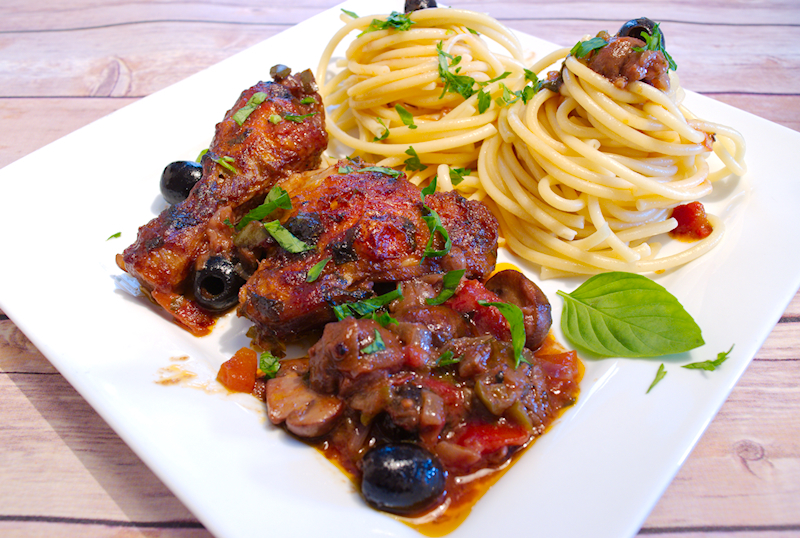 Trust me, the mushrooms are an excellent addition to Chicken Cacciatore. 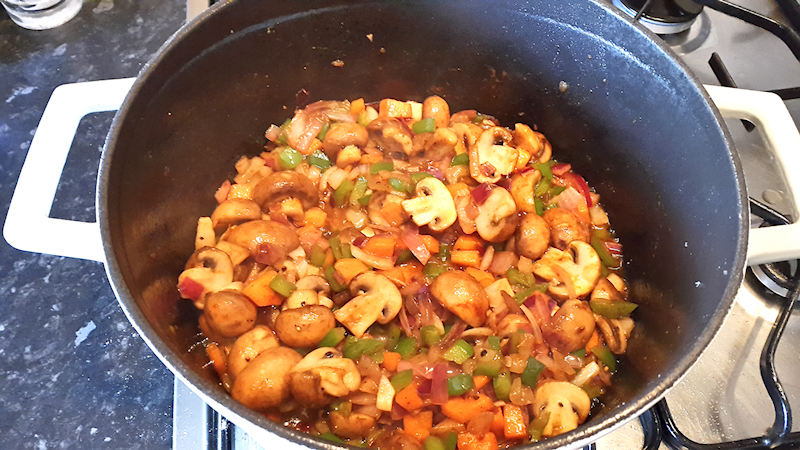 You do like mushrooms in garlic and wine sauce, don’t you? You will enjoy them here too. 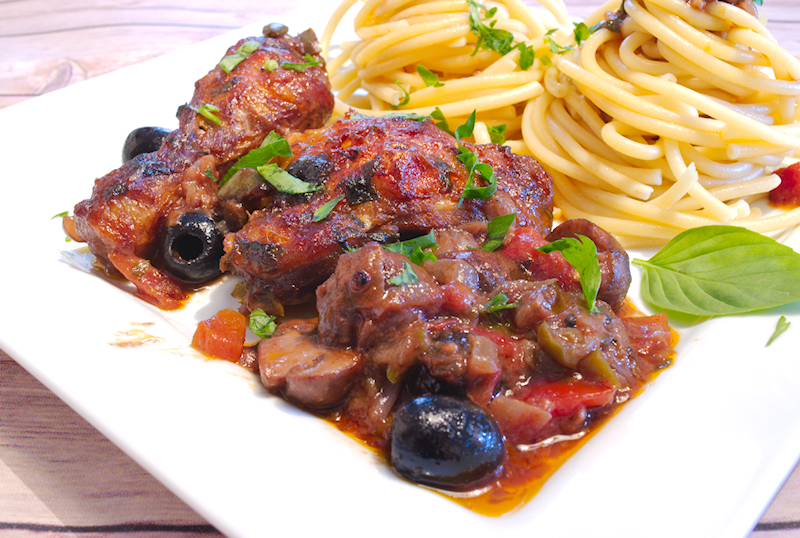 Chicken Cacciatore can be cooked in the oven or the stove. I used a nice pot that can go in the oven and left it there for ~ 2 hours so the chicken has absorbed all the flavors and the meat falls from the bone. A couple of hours cooked on low heat would give the same result I guess. However, you can’t get the final browning of the chicken when you let it cook in the oven uncovered. So, make some nice spaghetti or Bucatini and enjoy this lovely recipe of Chicken Cacciatore! 4 chicken thighs and 4 drumsticks with the skin on. 200 gr of mushrooms cut in half. 1 carrot cut in cubes. 2 ripe and sweet tomatoes coarsely cut. 250 ml (9 fl oz) tomato passata. A bunch of flat leaf parsley finely chopped. ½ bottle of Chianti wine. Wash the chicken pieces, dry them with a kitchen towel and season them with salt and pepper. Add the olive oil in a deep pot (or Dutch oven) that can go into the oven. Heat up the oil on a medium-high heat. Coat the chicken pieces with flour and fry them starting with the side with the skin on. Cook until nicely brown in both sides and set aside. Use a wooden spoon and scratch the bottom of the pot to release the sticky bits. 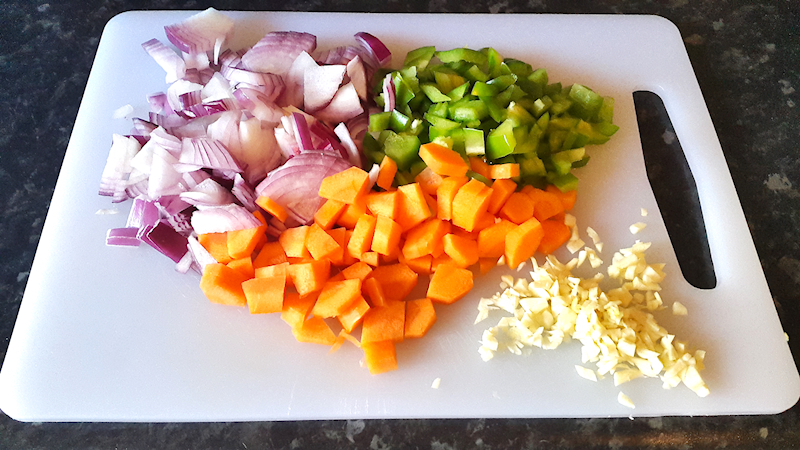 Set the heat to medium and add the onion, green pepper and carrots. Add the oregano, paprika and season with salt and pepper. Cook until they start getting brown. Add the garlic and cook for another minute or two while stirring. Add half of the wine and bring it to boil. 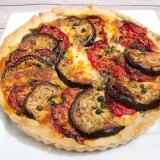 Add the parsley, basil, fresh tomatoes, olives and passata, season with salt and pepper and give it a good stir. Place the cooked chicken pieces and add the remaining wine. The juices must cover the chicken pieces. If not, add some hot water. Cover the pot with a lid and let it slowly-cook in the oven for ~ 90 minutes. Remove the lid and let it cook for another 15 minutes to get a nice brown color. 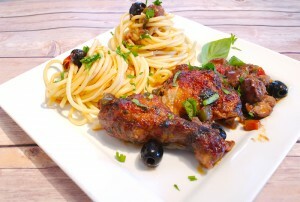 Serve Chicken Cacciatore hot with rice or Bucatini pasta.